I am new on here. 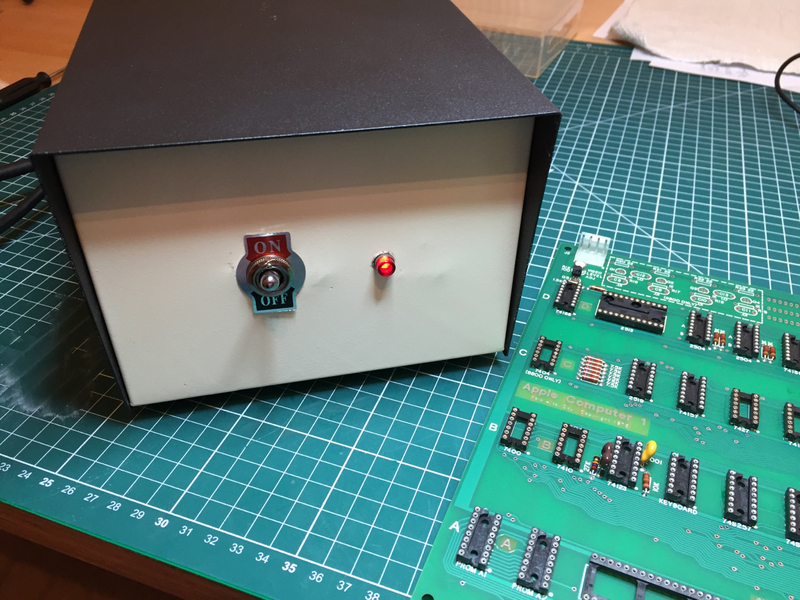 I am planning to build a Mimeo 1, Apple 1 replica. I was wondering if anyone had any experience or views on using a Mimeo 1 on a 230v 50Hz system (rather than the 115v 60Hz the Apple 1 was designed for). The recommended Stancor or Triad transformers are obviously no good as they are for 115v systems. I have seen what I think are a number of potential 230v alternatives, but wondered what others have used and whether anyone has any recommendations. My bigger concern is whether the power supply circuitry on the board can cope with the 50Hz AC system. My understanding (and my understanding is very basic) is that for 50Hz mains, a power supply would theoretically require a 20% larger filtering capacitor than for 60Hz mains given the correspondingly longer discharge time on each cycle. Has anyone experienced any problems running the system on 50Hz mains and has anyone needed to change any of the capacitors? Finally, I assume that the composite video output of the system is at 60Hz whereas many monitors produced for the UK and European markets were designed for a 50Hz signal. Has anyone had any issues source a suitable display? Again any comments would be greatly appreciated. Regarding your last question, ideally you want a monitor that accepts an NTSC signal, which was the North American 60Hz standard. The 50 Hz standards in other parts of the world were PAL and SECAM. These three standards are completely incompatible (and not just from a line rate standpoint). There are inexpensive video converters on the market though, and that might be your best bet (search eBay). The Apple 1 NTSC is a bit out of spec, so there is some risk that a converter may have a problem. 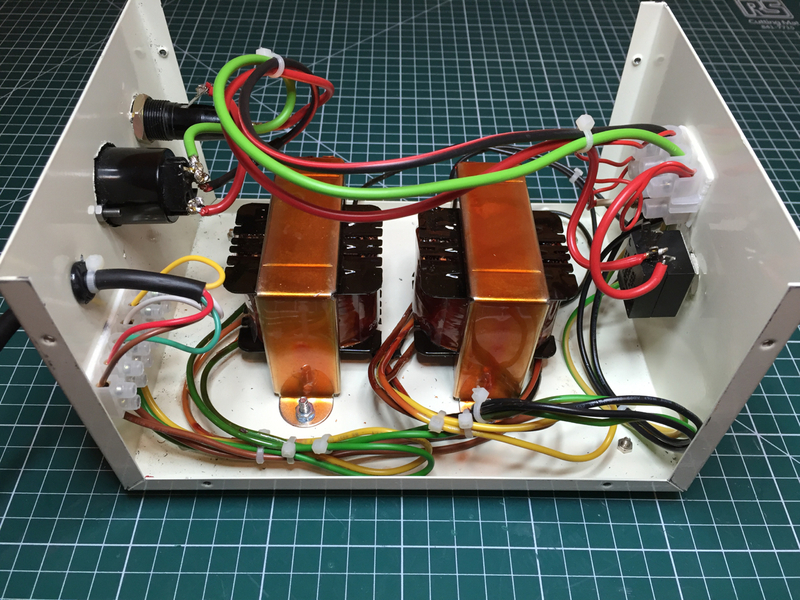 From a power supply point of view a 60 hertz transformer will work at 50 hz and the increased ripple is not an issue since all four rectified supplies pass through voltage regulators which will clean up the ripple. For the video, why not get a 60 hz NTSC monitor and add an external 230 to 115 volts transformer ? The power supply in the analog NTSC monitor on the other hand might need some additional capacitance in the power supply to cope with the 50 hz ripple. i will cover this a bit more in detail for better understanding of all that users. Some part of the questions have been answered in the replies above. and line displays same situation but with 60 Hz. To get better view to details the sections are split to 1/10 of a second. 6 complete waves at 60 Hz AC. in the same period of time would add up to 12 half-sinewaves. i wanted to spot out the real influence of the size of that capacitors. input voltage gets less than 3 Volts more than the output voltage. by heavy load at the output won´t have efeect to the regulated voltage. the regulators won´t affect the operating condition of the Apple 1.
instead - allthough they are not like originally specified. get a good filtering to get rid of that "noise" ( spikes ). The far more important part of the question will be answered below the picture. understand the answer to the second part of the question. Section D) displays the main part of the base timing of the Apple 1.
chips of the Apple 1. At pin 6 it issues the base frequency of the videosignal. ( see section E) ). the data-information is resulting from the chips at location C3 and C4. other data from Chip at position D8 - adressing the bytes of the character. Q5 and then the sum of that 2 signals is passed by the Q5 to the videoconnector. doesn´t have any relation to the videosignal of the Apple 1. But one thing has an influence - the frequency of the monitorpowersupply. resulting transverse shifting of the picture. Finally to the question about the transformers. 230 Volt AC undless you use a "stepdown" transformer from 230 Volt to 115 Volt. less strong magnetic field distribution. Thanks speedyG! That is an amazingly detailed, helpful and thorough response. In terms of the power supply issue, although the level of detail is way beyond my ability, you have confirmed what I suspected namely that the system should be OK, as long as it isn't used under load for a prolonged period. In terms of the video, as I understand what you are saying, unless I can find an NTSC compatible domestic monitor (unlikely) it may be just a question of trial and error if a PAL monitor will be able to display a stable signal. That being the case, it would be really helpful if you could let us know what monitor you are using. I note that you are using modern toroidal transformers – which is the route I was probably going to go down. Again, it would be helpful if you could say which make and part numbers you actually ended up using. Note that I have a TAXAN brand monitor that has worked for both Apple generated PAL and NTSC. I know this because I acquired an Apple II that was configured for PAL (including crystal), and it took me a while to realize it, as I happened to initially use that TAXAN monitor with it. The TAXAN wiki pages says they operated in the UK. I wonder if they were designed as dual purpose, or if mine is an exceptional unit. Yes, they were big in the UK. In the early 1980s I used to work in a shop that sold electronic components and home computers – most notably the BBC Microcomputer (which was huge over here). We sold a lot of Taxan monitors. I am trying to source a composite monochrome monitor from that era that claims to have dual NTSC/PAL compatibility. It's not easy because detailed data about monitors from that era is hard to come by and, in any event, there is not a lot of choice. I think I may have found one though – a Philips BM7522. I have also identified another possible candidate – a Zenith ZVM-122-EA. If anyone has any knowledge of these, comments would be much appreciated. Well i have several Monitors. Its a analog RGB Monitor snd it has the option by switch to operate in various modes. also capable to display color. then i have one from Zenith. and as far as i remember this is a valid statement with all Models from Zenith. is also a Apple III Monitor but i haven´t used it in the last years. Its a analog RGB Monitor and it has the option by switch to operate in various modes. display in every case... thats the one i also favor in use with the Apple 1. You wouldn't happen to know the model number of the Zenith? Is it one of these: http://www.1000bit.it/ad/bro/zenith/ZDS-122-123S.pdf? Excellent. I have been looking at one of those. There's a refurbished model available for sale in the UK at a reasonable price. I used 2 transformers available here in Austrailia from JayCar an electronics shop. I have included scans of the boxes that they came in, as I'm planning to build another power supply. You will have no problems with 50 and 60hz systems as far as the power supply is concerned. I have used a Mimeo-1, an Obtronics Apple-1 and a Mike Newton Apple-1 clone as well as repairing a Mimeo-1 mother board (that earlier caught fire-tantalum caps were supplied as the bypass caps) on the same power supply with no problems. For the monitor I use what works on an Apple II, in fact I use an Apple II monitor and a Monitor III (originally for the Apple III but many apple users use it in an Apple II without problems). I found no problems with distorted video at all. Just get a monitor that accepts a composite (not component) video input. Also there are some fancy video converter units in China Via EBAY that you can use if you cannot get something with composite video input. 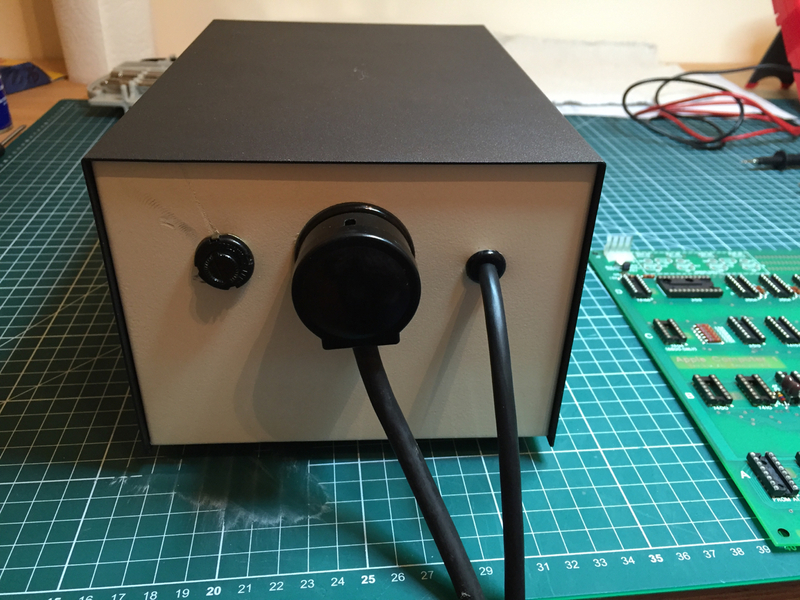 One suggestion: Build your power supply into an old AT PC power supply metal box. Gut everything except the 240v switch and the 240v plug. That way it ends up in a nice safe metal box that is earthed for safety, and the power cord that came with the old power supply can be used. Thanks tolderlund for the link to SpeedyG's guide to insert content in my response to lazarusr. I can now do it. I have been a little concerned about mains voltage wiring and the possibility that the home built power supply might be unsafe. I have a solution that uses an old AT (or similar) power supply already with the hardware in place to go from the mains to the PS box. It might even have a mains switch, and it should have the IEEE mains socket. This means that the only mains wiring to be done is to connect the IEEE socket outlet to the transformers. Warning: mains voltages are potentially lethal, in some countries, this has to be done by a licensed electrician. Do not attempt this if the above applies, or you do not know what you are doing. Thought I'd show what I ended up doing in terms of the power entry module. I found this case on eBay which had a suitable vintage look. The switch, power light, fuse holder and mains connector are all period appropriate vintage parts.